Pianist La Vinh Hoang, 49, who is the third generation of a music family in Hoi An, and his friends have revived Cung Dan Xua (Old Melody)band and live music performances in the ancient city. Hoang said his parental grandfather, musician La Hoi, joined an anti-fascism movement in Viet Nam in the 1940s, and his father La Gia Quang was a co-founder of the Old Melody.Hoang said he is in charge of piano and keyboard, while other members play violin, guitar, mandolin, accordion and vocals. "We are music lovers and amateurs. The band was regrouped few months ago after a three-year vacation since the old band was dissolved in 2012," Hoang said. "The old members of the band either died or retired from music playing due to old age. They were known in Hoi An as the under-90 live music band in a cafe shop in Le Loi Street," he said, adding that the band focused on old melodies and Vietnamese romantic songs composed by prewar musicians. "They played at a cafe in the old quarter to serve tourists and restored a well-known genre of romantic music in Viet Nam from the early 1940s," he recalled.He said the band then stopped the performance when some members passed away, and others could not play with old age.In early 2015, the central city's cultural centre decided to regroup the band with the same old style, but younger members. "We want to restore the live music performance that the old band had built from two decades ago. The performance depicts the soul and culture of people living in the ancient city from previous centuries," said the centre's director, Vo Phung. "The live music show is often organised on the 14th day of a lunar month - the day that the city lights up with lanterns to host tourists visiting the full-moon eve night," Phung said.The band still retains its name and moved to the city's rest area at Nguyen Thai Hoc Street near the Hoai River bank.Nguyen Thi My Phuong, a vocalist of the band, said all members of the band were born singers or musical instrumentalists. "We all grew up in amateur music performance, and all members devote playing the best performance with a love of music," said Phuong. 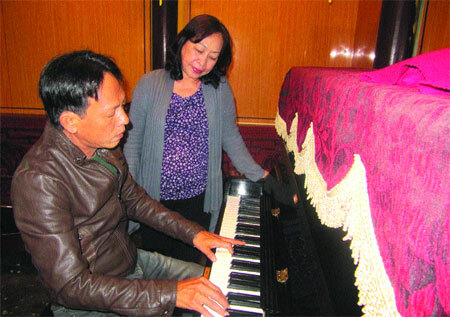 Phuong, 56, who was born in Hoi An, said she had a 13-year experience as a voluntary singer at the city's musical troupe. "We sing with endless emotion and love for music as we did from previous decades. The city is in my heart and I am devoted to it," Phuong said.She said she herself also managed a live music cafe shop in the old quarter since 1992. 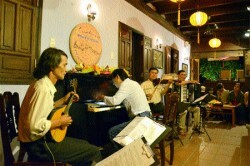 "All band members make their own living from different jobs, but they have a common love of singing and music, and we often put aside everything for a night public performance once a month," she said.The Hoi An-born singer said the performance at the city's rest-area site depicts hospitality, culture and the friendly manner of Hoi An people to tourists.Each night performance often draws around 50 attendants from locals and visitors sharing the romantic melodies of songs from the 1950s.Hoang, the band leader, said members don't often meet before the performance as they are busy with jobs. "Time is precious for us when we have to struggle to earn a living. Few of us could live well from music performances, but music is really a part of our lives. Each of us finds our way to play music together once a month at a rendezvous for tourists," he said.The pianist said the little fee from performance could not cover their living expenses, but it's a chance for them to recall the romantic music left from ancestors.Hoang Vu, who is the only member from the defunct Ancient Melody band, still keeps singing with the newly established troupe every month. "Music is in my heart and soul. It reminds me that life is always beautiful. Music can ease the pain and sorrow of people, while create endless love to all people," Vu said. "I still feel healthy with my over 70-year-old body and I shall keep singing all my life. Singing with excitement at the night performance once a month is my little story, talking to tourists about the beauty of Hoi An - land and people," Vu said.He said he wanted to send a message to all who come to Hoi An that they would fall in love with it.Vu, who is a retired teacher, said residents in Hoi An "always welcome visitors with love of music, friendly smiles and hospitality. ""Please, come to see us. You'll have a magic night with our music and passion of full-moon eve night with light of lanterns in all corners in Hoi An. "Pianist Hoang said the band needed more investment in new equipment and instruments to make the performance more attractive.He said contemporary and classical music should be included in the performance. "We wish to have more than one performance each month as we could do exchanges with visitors. Tourists can join with us when they tour around the ancient town, and the performance could give them a deeper understanding about Hoi An before they enjoy a perfect night of lanterns under the moon."